Today i spent some time thinking about a good solution for the hood of the Laser Competition. This piece has caused a lot of frustration, and I’m not alone. You need the hood if you want to use the side guy lines for stability. You need the hood if you expecting wet weather. To tie the hood to the fly you have to put the very short pieces of black rope trough two very small loops attached to the fly on both sides of the pole sleeve. To put tension on the hood you have to put one side of the rope coming out of the sleeve trough a loop near the pole ring and tie it to the other rope coming out of the hood. In bad weather, in bad light conditions, when tired of a long day hike, this is almost impossible. Strange because the tent is marketed as an adventure race shelter. Well even in good weather i find it frustrating and time consuming to get it right. Every time I used the tent i thought of ways to get it fixed, but when home the tent disappeared quickly in the gear closet. But today I find time to experiment with some setups. Leaving the hood attached in the original way can be dangerous, when putting the pole in the sleeve. The pole gets stuck against the loop and rope and presses against the fabric. When the mushroom shaped pole end has some scratches on it from standing on a hard surface this can happen easily. 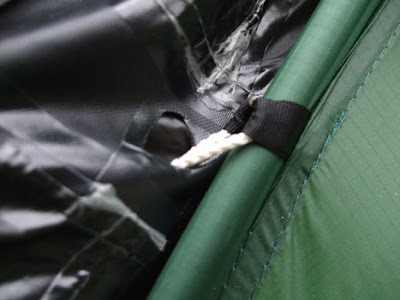 Attaching the guy lines directly to the loops on the fly, will make the tent stand firm, but the hood can’t run down totally. Some options I’ve read on internet suggested using small carabiners for quick fixation at the pole end loop. But this is no solution for the small ropes and loop connection. Some options I’ve read suggest a combination of both, and seamseal everything. 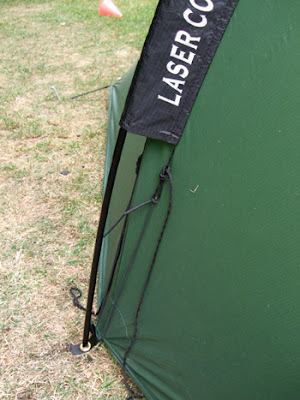 The way the pole sleeve is attached to the fly however this means seamseling 4 sides on the outer and 2 on the inside. Because the zipper is attached to the these seams, only sealing and testing it in the garden will tell if it will be adequate. Quickly put the hood on or off. 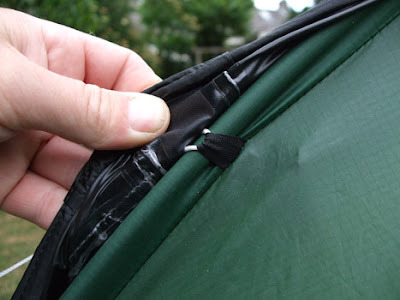 Leave the hood on the tent without the risk of ripping the fabric. All connections must be possible wearing gloves. 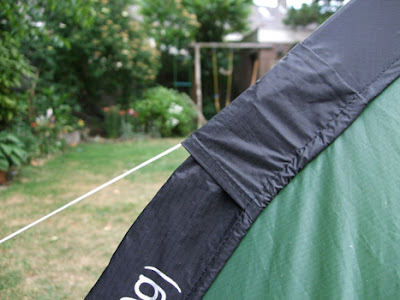 A direct connection between guy line and tent. First I experimented with the lower near the pole end attachment of the hood. And after some tries I came up with the use of shock cord. This attaches to loops made in the end ropes from the hood. On both sides this will give enough tension to put it firmly in place, and enough stretch to easily pull it over the pole end. It’s not attached to the therefore made loop. Secondly I experimented with different configurations of the guy lines. As I wrote the most steady result came from directly attaching the guy lines to the small loops. I was surprised to see that is was so much more steady compared to the original setup. This has to do with the slack from the hood attachment and the hood to the guy line. I could not see another solution than to remove the small attachment ropes near the guy line attachment. This removal was done by cutting it out with a scissors, leaving a nice hole through which a guy line can run. Because this hole is tucked away under an extra layer there’s no change for water to get in. With this setup the tent is steady and direct connected and the hood takes care for the weather. I have to find a good way to leave the middle of the hood attached. And / or when removing the hood, a way to simply connect and reconnect the guy lines, instead of pulling them all the way through the holes. Further, the guy lines were mainly used to pull through the hood the tent down, and not so to withstand a wind force from the side. With the use of longer guy lines the forces used on the hood connecting loops are far bigger. So new, stronger guy lines attachments have to be made. 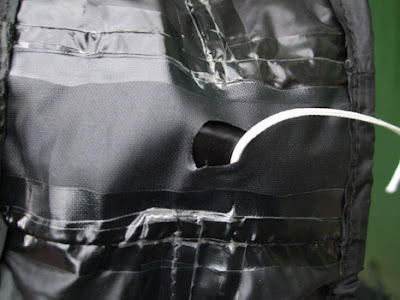 I also going to check in the next days if the original cord that is in the hood is still necessary or that the shock cord can be attached directly to the hood material itself. It would be nice to trow something’s of which balance the added weight, a bit.